Team AirSwap went live on YouTube with the latest updates, discussing stablecoins, security tokens, tokenized real-estate, and decentralized trading with partners QCP Capital, Securitize, and Propellr. Tune into the stream below. It’s been over a year since the AirSwap Token Launch, and we have since celebrated many milestones: the launch of Token Trader, Token Marketplace, and our Partner Network. More recently, we’ve introduced Conversational OTC Trading and AirSwap Spaces. 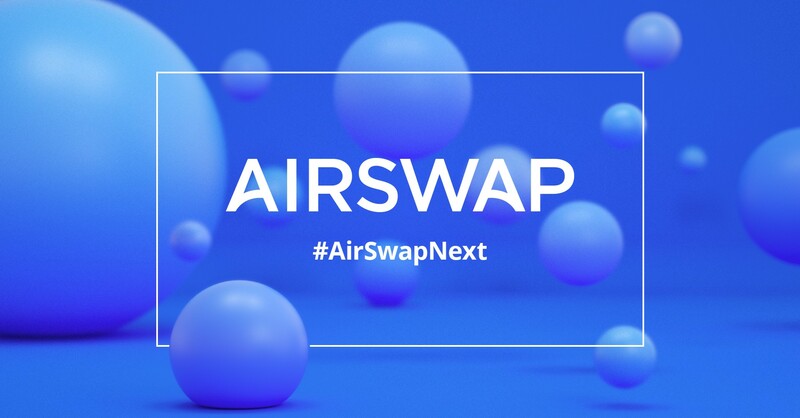 This week, AirSwap’s Rob “Crypto Bobby” Paone hosted our quarterly #AirSwapNext event on his YouTube channel, inviting community members to learn about the state of AirSwap. Rob and his guests covered a range of topics, including the rise of stablecoins, digital securities, and Fluidity’s role in the inaugural tokenization of a $30 million real estate property in Manhattan. The intersection of these three technologies — stable currencies, digital securities, and tokenization — has incredible potential. AirSwap’s mission is to empower people through global, frictionless trade, and we are honored to be on this journey with you. #AirSwapNext opened with Maxime Bucaille, an analyst for AirSwap, and Darius Sit, CIO at QCP Capital in Singapore. QCP is the first over-the-counter (OTC) trading desk with its own Space on AirSwap. Maxime and Darius discussed the prevalence of OTC trading in the crypto space and the rise of stablecoins. Darius estimates that “80 to 90 percent of the crypto liquidity is in the OTC market and not on exchanges.” OTC trading is attractive as it allows for more efficient counterparty discovery and seamless negotiation and settlement. Instead of going to multiple exchanges and incurring fees, OTC traders enjoy broader networks and economies of scale. OTC trading desks are essential for liquidity in the market, said Maxime, who previously worked as a foreign exchange trader at BNP Paribas. “If you look at the crypto market right now, it’s so fragmented,” he continued. “If you wanted to move $50 million Bitcoin, you would probably have to go to 10 to 20 exchanges to get the best price. The OTC desk has the proper infrastructure to be able to connect you and provide you with the best price on every one of your orders.” Decentralized exchanges are particularly attractive to trading desks as they offer more security and control and access to a global marketplace. Another topic being widely discussed in the crypto space today is the role of the security token, or digital security. To provide context on the impact of digital securities Rob welcomed AirSwap’s in-house counsel Khurram Dara and Jorge Serna, VP of product at Securitize, a compliance platform for digitizing securities on the blockchain. Securitize is a white-label platform that provides all of the lifecycle support to securitize assets compliantly — from supporting issuers in raising money, to running all of the checks for the investor, including KYC/AML compliance — using Ethereum as the baseline for its technology. As such, its compliance verification relies on smart contracts and is programmable. “The model for digital securities isn’t trustless,” explains Jorge, “it’s requiring trust in the issuer.” After Securitize verifies parties through its protocol, it adds them to a whitelist that it shares with Ethereum. Recently through AirSwap, a test of the first peer-to-peer security token transfer was completed on a public blockchain with Securitize’s DS protocol. While certain aspects of securities transactions cannot be automated, like investor due diligence and suitability checks, token contracts and whitelists can enforce restrictions programmatically and are easier to verify with the help of compliance protocols like Securitize’s DS protocol and Harbor’s R-Token standard. With our latest product, Spaces, projects and platforms can create their own space on AirSwap, setting their own on-boarding requirements and trading parameters. The combination of these tools allows an issuer, for example, to create a digital bulletin board for its digital securities where parties can post indications of interest and leverage the Swap Protocol, all in a “walled garden” environment. Following that discussion, Rob invited Fluidity co-founder Michael Oved and Todd Lippiatt, CEO of Propellr to discuss an exciting application of tokenization. Last month Fluidity and Propellr, a digital end-to-end private placement firm, announced the tokenization of a $30 million real estate property in Manhattan. Forbes reported that the luxury condo development, located at East 13th Street in the East Village, is the first major asset in Manhattan to be tokenized on Ethereum. As is par for the course with the introduction of any new technology, there are a number of misconceptions around tokenization, which Oved and Todd addressed in their conversation with Rob. For one, legacy investors often incorrectly assume that tokenization means turning everything into cryptocurrency. Investors have the option of acquiring either analog or digital securities. Oved and Todd recently published a whitepaper The Two Token Waterfall about the pioneering capital structure that applied blockchain technology to the real estate transaction. Fluidity and Propellr’s Two Token Waterfall framework represents both debt and equity classes and is designed to create more transparency, reduce transaction costs, and allow for increased liquidity and opportunities for secondary trading. In short, the Two Token Waterfall framework solves for the liquidity paradox in private securities. AirSwap’s Maggie Hsu broke down this innovative capital stack in a blog post, highlighting the significant opportunities for retail investors. The livestream concluded with an update from AirSwap co-founder Don Mosites, who leads product development. Don gave viewers a tour of AirSwap Spaces, which allows groups to create their own “space” on AirSwap and allow approved parties to efficiently discover, converse, and make decentralized trades. The intuitive UI includes boards powered by the AirSwap Indexer and “streams” for users to receive messages and updates. Users are able to become “verified” by completing the KYC/AML verification process with AirSwap partner AxiomLevel. Don shared that the “effort right now is to optimize trading workflow to desks” like QCP through Spaces.